We’d love your help. Let us know what’s wrong with this preview of The Blessing Way by Tony Hillerman. Homicide is always an abomination, but there is something exceptionally disturbing about the victim discovered in a high lonely place, a corpse with a mouth full of sand, abandoned at a crime scene seemingly devoid of tracks or useful clues. Though it goes against his better judgment, Navajo Tribal Police Lieutenant Joe Leaphorn ca Alternate cover edition can be found here. To ask other readers questions about The Blessing Way, please sign up. Do you need to (should I) read these books in order? Ms.pegasus The characters age as the series proceeds. However, I don't think there's any reason to adopt a strict chronological order for reading the books. Hillerman is chocolate. Read him at the beach, read him before bed, but read him. Then you too will belong to the high plains, the canyons and mesas of the desert Southwest. You will think and speak differently, quietly, thoughtfully. You will find the wound in the floor of the kiva, a melody which is a wound in silence, and you will follow, like Alice down the rabbit hole. This first book in the Joe Leaphorn series features an exciting conclusion, but it also features two heroes instead of one (Ethnologist Bergen McKee gets more pages than Leaphorn), and I don't think it is always clear where the focus of the novel is supposed to be. This is the first book in the Joe Leaphorn/Jim Chee series by Tony Hillerman. Jim Chee does not appear in this book and Leaphorn plays an equal role as protagonist against murderers with ethnologist Bergen McKee. Leaphorn is looking for Luis Horseman, who cut a Mexican in Gallup, New Mexico. Horseman turns up dead with few clues as to how he got there. Leaphorn and McKee keep hearing rumors of a Wolf Witch roaming the reservation. They both try to track down the Wolf Witch, McKee because of his research, and Leaphorn because it may have something to do with Horseman's death. I like the way Leaphorn gathers clues about the Wolf Witch. There is a great deal of information about Navajo traditions and the way their build their hogans, following the Navajo way. It's been mentioned in other reviews, but this particular book does seem to suffer from a bit of an identity crisis: it doesn't quite seem sure of its main protagonist. You'd think it would be Joe Leaphorn, but it just may not be after all. That said, it's certainly a rather interesting book. Navajo symbolism and mythology permeate the writing to such an extent that I initially found it somewhat difficult to follow the story, but once you get used to the writing style it actually reads quite fast It's been mentioned in other reviews, but this particular book does seem to suffer from a bit of an identity crisis: it doesn't quite seem sure of its main protagonist. You'd think it would be Joe Leaphorn, but it just may not be after all. That said, it's certainly a rather interesting book. Navajo symbolism and mythology permeate the writing to such an extent that I initially found it somewhat difficult to follow the story, but once you get used to the writing style it actually reads quite fast. It's a fairly sinister story too, with some scary characters prowling around in the desert. I would have liked to rate it a bit higher, but it isn't quite there yet. There's a lot of promise here, though, and it has atmosphere in spades. This is only book 1, after all, so the characters are still finding their feet at this point. I'll definitely be looking into the next instalment in the series (Dance Hall of the Dead) and in particular Skinwalkers since it seems to be the book that made Joe Leaphorn "famous" (so to speak). I usually don't do this, but DNF on page 106. I can't make heads or tails out of what's going on, and I'm bored stiff. Okay, I finished it. Still stand by my original opinion. 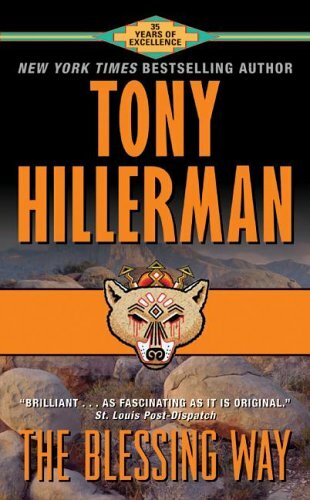 I actually read this quite a long time ago and I don't remember the details, but I've never read a Tony Hillerman I didn't like. This is the first of Hillerman's Joe Leaphorn/Jim Chee/Navajo Reservation mysteries, and I read in an interview that it has so many inaccuracies about Navajo culture that it now makes him cringe. Apparently, though, the Navajo people were quite pleased with his respectful interest in their culture, and they liked the book despite whatever weaknesses it may have. Of cour I actually read this quite a long time ago and I don't remember the details, but I've never read a Tony Hillerman I didn't like. Many years ago I read several of Tony Hillerman's Leaphorn & Chee books. Around eight books in the series I believe. When I saw the Kindle version on sale at Amazon a while back I decided to buy it and check it out again. Although the title indicates "Leaphorn & Chee" there is no Jim Chee and Joe Leaphorn often takes a backseat. In fact the main protagonist appears to be Bergen McKee, a college professor who returned to the Reservation in order to continue his research of Navajo witchcra Many years ago I read several of Tony Hillerman's Leaphorn & Chee books. Around eight books in the series I believe. When I saw the Kindle version on sale at Amazon a while back I decided to buy it and check it out again. Although the title indicates "Leaphorn & Chee" there is no Jim Chee and Joe Leaphorn often takes a backseat. In fact the main protagonist appears to be Bergen McKee, a college professor who returned to the Reservation in order to continue his research of Navajo witchcraft. The story opens with a Navajo in the desert of Arizona fearful for his life. Something he has seen or become aware of. He is fearful of a Wolf-Witch. Is it superstition? Whatever it is his body is later found, his mouth full of sand. Navajo Tribal Police Lieutenant Joe Leaphorn is called in to investigate the death, a death where there are no tracks or other clues as to what happened. Bergen McKee is a tenured college professor who is still recovering from his divorce five years ago and returns to the Reservation to continue his research of Navajo witchcraft after receiving an invitation from his friend Joe Leaphorn. McKee is a patient man and he needs to be if he wants to learn about the secretive world of the Navajo. When he questions Old Woman Gray Rocks he learns about the comings and goings of various Navajo and outsiders. In the meantime Joe Leaphorn observes a two-day Enemy Way ceremony that is supposed to turn the witchcraft back on the witch. The ceremony is quite elaborate and expensive. It requires singers, special performers, feasting and gifts. Leaphorn concludes that there must be something behind the wolf-witch rumors for the family to pay for this ceremony. It also proves, to Leaphorn, that the witch must be an outsider. If it were another Navajo a different ceremony would be performed. Picked this up because I was looking for something different from the murder-in-a-small-English-town-thing. Though it took a while to really get going, I found the people and setting interesting, and liked Joe Leaphorn. When it comes to writing descriptions of the southwest, none can compare to Mr. Hillerman. He can set a scene with a saw-whet owl, a fading sunset, and a distant outcropping of gray-streaked red sandstone. He's magnificent at this, does a better job than any painting or photograph. Add to that the detailed descriptions of various native American rituals, along with insight into the cultures, the nuances, even the way certain native Americans speak, the writing is amazing. You can see why it's No. 1 in the series - the MC just isn't there yet. This is Joe Leaphorn, Hillerman's No. 1 man, but there is no clear sense of who Joe is - or why he is, etc. - in this book. I've read a few others in the series and I think the picture of Joe does becomes clearer. But Joe seems missing in this first novel. Most of the 'doing' and the 'talking' are left to other characters. Perhaps, seeing this is a re-read for me, I expected too much. The story involves Joe's investigation of a man found dead, his mouth full of sand, in the desert. The poor dead guy had been on the run believing he'd killed a man, but Joe wants word sent out - through the dead man's friends and family - that the victim is still alive, hence: come in and talk to the law. In the course of sending out this message, Joe interacts with several native Americans from various tribes and with different outlooks and cultures, which, IMO, is the high point of the book. At any rate, we soon lose Joe to a host of other characters, situations, problems, and scenes replete with high tension, some of which are located in the high cliff dwellings of earlier southwest peoples. That part is fascinating, too. So one star off for the fact Joe is the MC, or maybe not. He's def. not the star of this show, just there at the start and near the end. As a mystery fan, I had been meaning to check this series out for a while. But it wasn't until I spent a rainy weekend in Napa and took temporary shelter in a lovely used bookstore that I saw a paperback copy and finally picked it up. It may be my best used bookstore impulse buy ever, and I have made quite a few of those. There is not much new I can add to the conversation about the mystery handled by Arizona Navajo Tribal Police Lt. Joe Leaphorn in this novel, being that was originally published As a mystery fan, I had been meaning to check this series out for a while. But it wasn't until I spent a rainy weekend in Napa and took temporary shelter in a lovely used bookstore that I saw a paperback copy and finally picked it up. It may be my best used bookstore impulse buy ever, and I have made quite a few of those. This first book in the Leaphorn series, really isn't that great. There's a corpse with sand in his mouth, and a hunt for a missile. The story is pretty simple, really only enough here for a novella, and it drags along. Leaphorn really isn't in it very much, either. Sort of hard to believe it heralded a series that would last over 40 years. THE BLESSING WAY was Tony Hillerman's first novel. Although Navajo police officer Joe Leaphorn appears in the book, he is a secondary character. The main character is Bergen McKee, a tenured professor with expertise in the social context of Navajo witchcraft. McKee is still recovering from his divorce five years ago and has returned to the Reservation to continue his research in hopes of revitalizing some of the ambition of his youth. He contacts Leaphorn, an old friend from college, to collect THE BLESSING WAY was Tony Hillerman's first novel. Although Navajo police officer Joe Leaphorn appears in the book, he is a secondary character. The main character is Bergen McKee, a tenured professor with expertise in the social context of Navajo witchcraft. McKee is still recovering from his divorce five years ago and has returned to the Reservation to continue his research in hopes of revitalizing some of the ambition of his youth. He contacts Leaphorn, an old friend from college, to collect current leads about purported witchcraft incidents. One in particular stands out. A wolf-witch was rumored to be in the Lukachukais canyon country where a fugitive Leaphorn is seeking is hiding out. The fugitive, Luis Horseman, appears in the first chapter and his puzzling observations add credibility to the idea of a witch wolf in the reader's mind. The rumor begins to resonate when there are reports of some strange encampments, and viciously slaughtered sheep. Patience is the key to penetrating the secretive world of the Navajo. McKee questions Old Woman Gray Rocks and is pleased to find his command of the Navajo language is steadily returning. At first she is reluctant to talk. Then she relates in a roundabout way the comings and goings of various Navajo and outsiders. Much of this has little to do with McKee's inquiry but he lets the old woman tell her story in her own way as dictated by etiquette. He also surmises that her reticence is partly to do with some of her own kinship ties. She does not want any of her relatives connected with talk about witchcraft. Leaphorn is also a skillful interrogator. He observes the two-day Enemy Way ceremony performed to safeguard Charlie Tsosie and turn the witchcraft back on the witch. The ceremony is rarely performed, quite elaborate, and expensive. It requires more than one singer, and includes special performers, feasting and gifts. Leaphorn concludes that there is something concrete behind the wolf-witch rumors for the family to pay for this ceremony. The ceremony also proves that the witch must be an outsider; if it were another Navajo, a different ceremony would be performed. Leaphorn carefully couches his skepticism in tactful statements which reveal his knowledge of the symbolism and mythic connotations of the ceremony. After this point, Hillerman focuses on McKee's narrative. The plot follows the pattern of a thriller rather than a mystery. Hillerman's use of Navajo belief is tantalizing. He never stumbles into a didactic voice. He alludes to a myth about Changing Woman and her hero sons, Monster Slayer and Water Child without much additional explanation. It is simply a fact of the Navajo cosmos. He describes the meticulous strictures of sand painting which have been handed down from generation to generation. A prevailing theme is the tenuous hold of tradition. The healer in the Enemy Way ceremony, Sandoval, laments the lost traditionalism which has taken place during his lifetime. “The People are losing too many of the old ways, Sandoval thought, and he thought it again when he had to tell Tsosie how to sit on the feet of Big Fly, and even had to remind him to face the east. When Sandoval was a boy learning the ways from his father, his father had not had to tell people how to sit. They knew.” (p.66) This knowledge is quite separate from the kind of book knowledge possessed by McKee, and even Leaphorn, who seems to Sandoval to recite his knowledge as if by rote. Such knowledge is not living knowledge that will guide all thought and emotion. This book was published in 1970. Hillerman's portrayal of Navajo belief will become richer and his writing more confident in succeeding books. At the time, his choice of a Navajo police officer was an innovative experiment. He continued to refine his portrayal of Navajo characters as he proceeded with the series. From the dust jacket: When Lt. Joe Leaphorn of the Navajo Tribal Police discovers a corpse with a mouth full of sand at a crime scene seemingly without tracks or clues, he is ready to suspect a supernatural killer. Blood on the rocks … a body on the high mesa … Leaphorn must stalk the Wolf-Witch along a chilling trail between mysticism and murder. This is the first in the series featuring Leaphorn. Hillerman weaves in considerable Navajo lore in this very real story of murder and mayhem. The point of view switches among the characters (although not the bad guy) so we are treated to the victim, innocent bystanders, and Leaphorn each observing parts of the puzzle without clear indications as to how the pieces fit together. Oh, we do discover who the Wolf-Witch is pretty quickly, but not WHY he behaves as he does. Hillerman leaves it up to Leaphorn to explain it all in the end. I love Lt Joe Leaphorn. He is methodical, steady, unflappable, intelligent, pensive, courteous, a keen observer, skilled tracker and ever willing to listen. It’s this last quality that makes him such a good detective. He hears the clues in both what is said and how it is said, and even in what is NOT said. I thought the dust jacket blurb was misleading; Leaphorn never actually suspects supernatural elements. He is all too aware that most such evil acts are perpetrated by very human killers. But he is certainly intrigued and puzzled by the appearance of the Witch, and the beliefs of the tribal people who have been terrorized (or just “bothered”) by him. In many ways this makes me think of the stories my grandparents or great aunts would tell … full of ghosts and spirits, yet also imparting valuable lessons on how to conduct oneself “the right way.” It’s a wonderful blend of the mystical with the realities of life. I’ll definitely continue reading the series. I love these murder mysteries set in the Navajo Nation and featuring Joe Leaphorn and Jim Chee of the Navajo Tribal Police. Well, eventually they feature Leaphorn and Chee, but Chee was added a little way into the series and is not yet a player in this book. In The Blessing Way, Joe Leaphorn tries to solve the mysterious death of a young man who appears to have been killed by a witch. We are taken deep into Navajo culture, their witchcraft lore and ceremonials of all kinds, as he assists profess I love these murder mysteries set in the Navajo Nation and featuring Joe Leaphorn and Jim Chee of the Navajo Tribal Police. Well, eventually they feature Leaphorn and Chee, but Chee was added a little way into the series and is not yet a player in this book. In The Blessing Way, Joe Leaphorn tries to solve the mysterious death of a young man who appears to have been killed by a witch. We are taken deep into Navajo culture, their witchcraft lore and ceremonials of all kinds, as he assists professor Bergen McKee, a scholar studying Navajo witchcraft, in tracking the killer. Actually, I was surprised that McKee was more of a force than Leaphorn in this story, although everyone is in jeopardy as the Wolf-witch comes after them in the remotest areas of the nation. As this is the first in a series of 18 books written by Hillerman, it seems as if he was feeling his way through establishing the foundation for more stories. The fact that Leaphorn did not have the starring role did not in any way affect my enjoyment of this book. I am glad that I went into this knowing that it wouldn't blow me away. It was pretty good, and I will continue with the series since it is supposed to get much better. A murder victim is found in a remote place with his mouth filled with sand. Lt. Leaphorn comes to suspect that supernatural forces may be involved. Tony Hillerman’s first Leaphorn mystery (1970) strikes me as one of his best in its balance of mystery, crime solving, and rich cultural background—an authorial creation of hoozho, that guiding principle of Dinee life, which the Blessing Way ceremony (hoozhoji) restores and maintains. The book’s title may refer less to the ceremony itself (which, in fact, the book scarcely mentions) than to the principle that guides detective Joe Leaphorn’s pursuit of a solution to crime. He must recognize what Tony Hillerman’s first Leaphorn mystery (1970) strikes me as one of his best in its balance of mystery, crime solving, and rich cultural background—an authorial creation of hoozho, that guiding principle of Dinee life, which the Blessing Way ceremony (hoozhoji) restores and maintains. The book’s title may refer less to the ceremony itself (which, in fact, the book scarcely mentions) than to the principle that guides detective Joe Leaphorn’s pursuit of a solution to crime. He must recognize what is not right, out-of-balance or off kilter about what the evidence suggests, which, if he pursues it with logic and moderation, will eventually lead him to an explanation. And (sure enough) it does. Meanwhile, hapless Anglo anthropologists find themselves caught up in the misdeeds of unscrupulous criminals, which had first prompted Leaphorn's investigation. Bad guys include a Dinee raised off-Reservation (thanks to the US government’s relocation program) and therefore much in need of a Blessingway, but more intent on garnering wealth and killing off anybody standing in his way. These protracted, tension-filled events nicely balance Leaphorn’s quiet, logical crime-solving. Set high up canyon cliffs in ancestral pueblo cliff dwellings, these scenes effectively incorporate levels of high suspense that I don’t generally associate with Hillerman’s style. Many of the reviews here have already pointed out that this first book in the long-running series about Navajo Tribal Policeman Joe Leaphorn has its problems. As a mystery, it's a little weak, the narrative is clunky, the characters not exactly finely-drawn. All true. It's also been pointed out that the stuff relating to Navajo traditions and mythology is fascinating and nicely done. That, too, is true, and is THE BLESSING WAY's saving grace. It should be noted that Leaphorn is not the main chara Many of the reviews here have already pointed out that this first book in the long-running series about Navajo Tribal Policeman Joe Leaphorn has its problems. As a mystery, it's a little weak, the narrative is clunky, the characters not exactly finely-drawn. All true. It's also been pointed out that the stuff relating to Navajo traditions and mythology is fascinating and nicely done. That, too, is true, and is THE BLESSING WAY's saving grace. It should be noted that Leaphorn is not the main character in this, his first appearance. The central protagonist is a professor of Navajo studies named McKee-- maybe Hillerman was uncertain, way back in 1970, if a series featuring an American Indian hero could sustain itself? Unfortunately, McKee is not very interesting, and the sections that move away from him and follow Leaphorn are LOTS more interesting. High on the desolate mesa they found the body. The mouth was filled with sand. No tracks, no clues. Every Navajo knew that nothing human killed like that. the Wolf-Witch before. Always it had eluded them, vanishing like a ghost on the wind. But never had it left such a horrifying trail of murder. For Lt.
Leaphorn, the case was a baffling challenge High on the desolate mesa they found the body. The mouth was filled with sand. No tracks, no clues. Every Navajo knew that nothing human killed like that. Wolf simply a challenge—now it's a matter of life and death. the history and the cultural stuff in this book was amazing. if the rest of the books are this culturally rich, I will read the books for the cultural references themselves. I don't remember a ton about the mystery but I read it in one day so this should tell me something. The first of a brilliant series of detective novels. The protagonist is a Navajo tribal police detective and the story is immersed in Navajo culture and the look and feel of the Four Corners region of the southwestern United States. As a near-native New Mexican (lived here since I was four) I recognized my homeland and the personalities of a lot of people who live here more strongly here than in any other author's work. On top of that authenticity, the result of extensive research and a flawless The first of a brilliant series of detective novels. The protagonist is a Navajo tribal police detective and the story is immersed in Navajo culture and the look and feel of the Four Corners region of the southwestern United States. As a near-native New Mexican (lived here since I was four) I recognized my homeland and the personalities of a lot of people who live here more strongly here than in any other author's work. On top of that authenticity, the result of extensive research and a flawless eye and ear for cultures and people, the character development is great and the plot is superb. I almost quit reading this after the first bit, because it was a lot of Indian folklore and superstition, which isn't really something I enjoy much of. I just wasn't really following it. There was one Indian called Horseman, another was The Wolf, and then there were the Wind People, etc. So, I went back and reread/skimmed over the part I'd read in a written version instead of audio, and figured out what was happening; it was more than just stories about strange beliefs, chants and ghosts, althou I almost quit reading this after the first bit, because it was a lot of Indian folklore and superstition, which isn't really something I enjoy much of. I just wasn't really following it. There was one Indian called Horseman, another was The Wolf, and then there were the Wind People, etc. So, I went back and reread/skimmed over the part I'd read in a written version instead of audio, and figured out what was happening; it was more than just stories about strange beliefs, chants and ghosts, although they were important to the story. The real story was that someone was killed, and there were strange things about the killing. The Horseman was actually simply the guy's last name, and he was a petty criminal on the run. The Wolf was some dude with a wolf skin over his head, which had meaning to The People (as the Navajo call themselves). The Wind People were just thrown in for color. There were two main characters - one was Lt. Joe Leaphorn, from Navajo Law and Order, as they call the police there, and the other was Professor Bergen McKee, a white professor specializing in Indian folklore and primitive superstition in Alburquerque. He had previous contact with Leaphorn about his classes, and they were friends somewhat. He was waiting for an opportune time to go back for more information. In this first book of the series, McKee was featured somewhat more than Leaphorn, although Leaphorn was shown to be a very capable investigator, and figured out most of what was going on. This, the first book in the long running Joe Leaphorn series, was an Edgar nominee for best first mystery back in 1971 and was a good listen on audio. I did think it started out a bit slow though but about half way through it picked up the pace. The narration was done by the always excellent George Guidall. I really liked the style of writing and the setting in this book. I think I'll continue to dwell on this series for a while. Con questo testo si entra in un mondo inesplorato, il mondo dei nativi americani. La natura del sentimento di questi popoli è espresso in maniera straordinaria, si vivono proprio le emozioni e la natura dei ragionamenti di una cultura, di un popolo. Le vie... queste vie mi incuriosiscono molto, "la Via Navajo dava poco valore alla proprietà, in realtà essere più ricco degli altri membri del clan portava con sé un marchio di ordine sociale: era innaturale, sospetto". Io sarò u Una lieta scoperta. Le vie... queste vie mi incuriosiscono molto, "la Via Navajo dava poco valore alla proprietà, in realtà essere più ricco degli altri membri del clan portava con sé un marchio di ordine sociale: era innaturale, sospetto". Io sarò un romantico, un filosofo ma queste parole nella nostra cultura esistono forse per in qualche errata congiuntura astrale che viene subito cancellata con orrore (sono ironico). Loved this book and the whole Navajo Mysteries series. The description of the reservation and the development of the characters is wonderful. I have read all of the series written by Tony Hillerman and I have also enjoyed the two books that his daughter - Ann - has added to the series. I feel that the heritage and culture of the Navajo are well served by these stories. Narrated by George Guidall, I nearly gave this book back to Audible. He was a very boring narrator. But I got used to him and near the end, he started using some expression in his voice. I had the Kindle version but wanted to be busy with my hands while listening. I didn't want to follow the text. So I stuck with it. Two things against this book before I even got started so take this with that grain of salt. First, it doesn't fit with my goal of reading women authors/women main characters. Second Narrated by George Guidall, I nearly gave this book back to Audible. He was a very boring narrator. But I got used to him and near the end, he started using some expression in his voice. I had the Kindle version but wanted to be busy with my hands while listening. I didn't want to follow the text. So I stuck with it. Somewhere between Michael Connelly and Craig Johnson. Love it. I'm going to enjoy Hillerman a great deal.